The Holy City of Jerusalem is for 3000 years the capital of the Israelites, Jewish Kingdom and State of Israel. Psalms 122:2: "Our feet shall stand within thy gates, O Jerusalem". This page is an overview of the old city of Jerusalem. Details of its sites are described in additional web pages. Jerusalem, the capital of Israel and the most Holiest city in the World, is located in the center of Israel, on top of the Judean mountains (700-800M above sea level). This strategic location, first selected by King David 3000 years ago, made the city the heart of the biblical Israel and the Jewish faith, a Holy city for the Christian and Muslim faiths, and the capital of Modern Israel. ~18 C BC Referenced in Egypt as "Rushalimum"
The following photo shows the old city, behind walls, from the south. 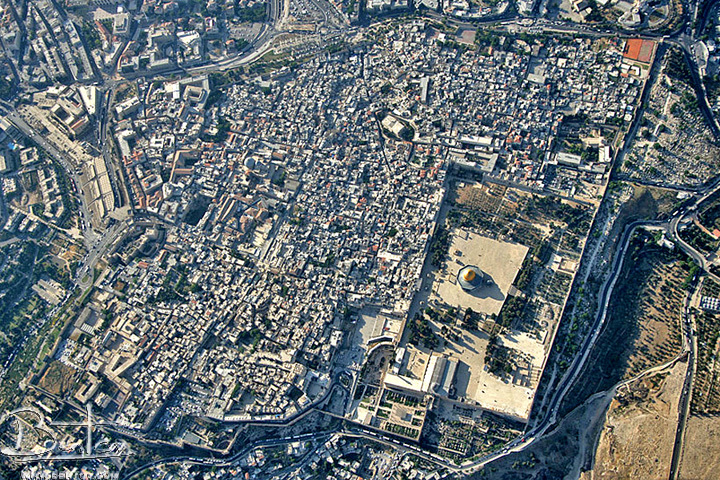 In the center, dominating the old city, is the Golden cape of the Dome of the Rock Mosque. In the background - part of the Modern Jerusalem. A closer look into the old city: David's Tower, near Jaffa Gate on the west side of the old city, is yet another symbol of the city. 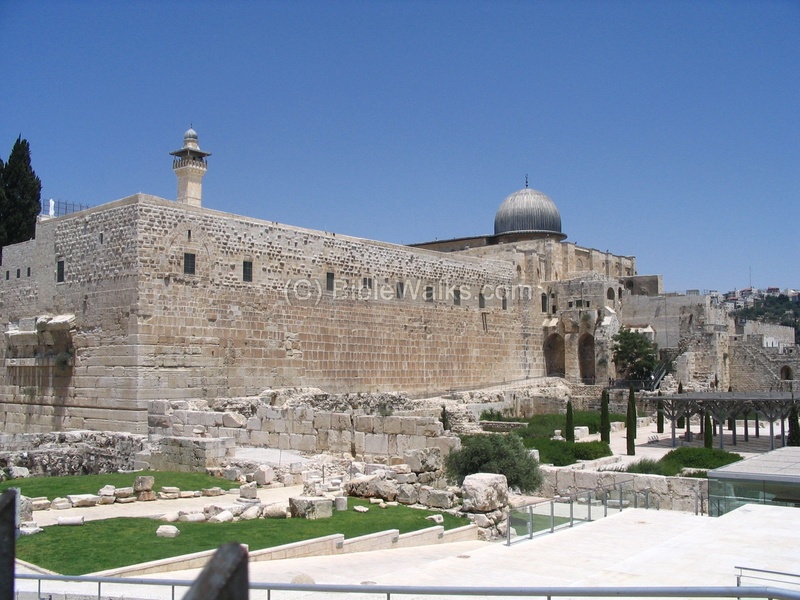 The Temple mount, where the Golden Dome of the Rock Mosque is located, has an inner wall, covering about 1/6 of the old city area. 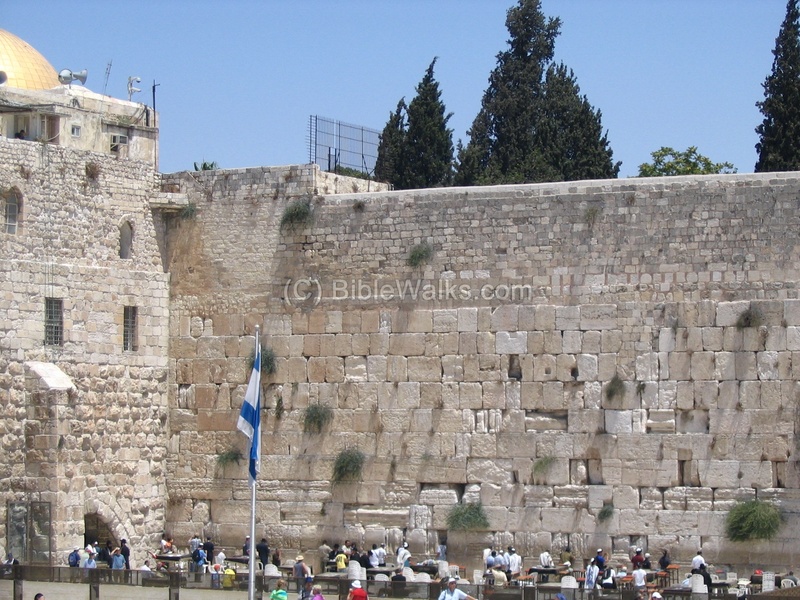 This inner wall also includes the "Wailing Wall" (or, Western Wall), the holiest place for Jews as seen below. The southern side, adjacent to the western wall, is seen in the following photo. On the left side, embedded in the wall, is the remains of "Robinson's arch" which was built by Herod as a staircase and gateway into the temple. On the right - the new archaeological garden which features another entrance to the temple mount - a huge staircase. Above, in the temple mount, the Silver dome of the Al-Aqsa mosque (built in 705AD). Jerusalem is rich of amazing sites, and we cover many of its Biblical sites. Check our sites gallery of the Jerusalem area. The page summarizes the sites currently reviewed in Jerusalem. 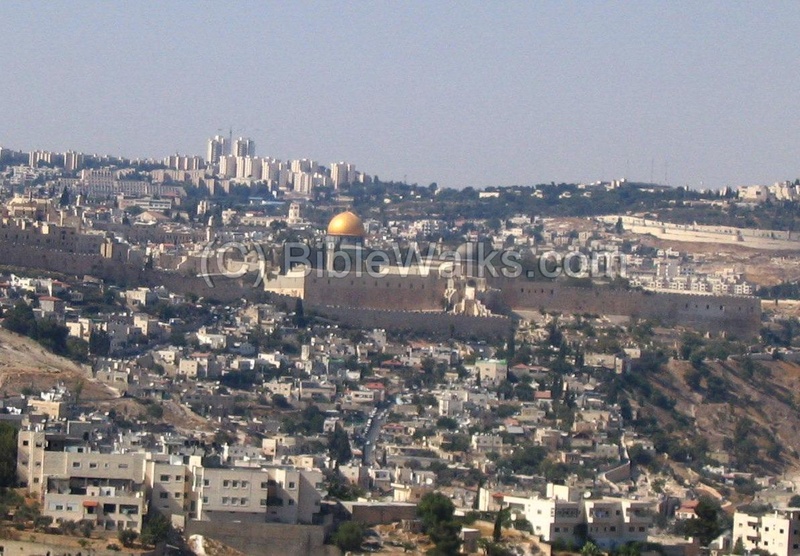 Jerusalem shows the sites that are reviewed in Biblewalks.com. You can point on the points to navigate to the selected point. Check also the Jerusalem maps page where the sites are superimposed on a satellite imagery. Tower of David and Jaffa Gate, Zion Gate, Mount Zion, Western Wall, Southern Wall, Temple Mount, Cardo Maximus, Mount of Olives, Basilica of Agony, Yad Avshalom, Tomb of Zechariah, Tombs of Bnei-Hezir, St. Peter in Gallicantu, Mary's tomb, Ophel and Hulda Gates, Via Dolorosa, Church of Holy Sepulchre, Burnt House, Broad Wall, Augusta Victoria, Monastery of the Cross, St. Francis, Dormition, King David's tomb, Last Supper , Armenian Church - St. Saviour - Mount Zion, St. James, St. John the Baptist , Sebils , St. Anna, Bethesda, Dominus Flevit, Ascension chapel, Russian Ascension convent, Pater Noster, Golden Gate, New Gate, Lions' Gate, Flagellation, Condemnation, Roman roads, King David's harp, Mar Elias monastery, Sultan's pool, St. Andrews, Ein Karem, Muristan, Redeemer, Al-Aqsa, Dome of the Rock, Dung gate, Second Temple Gates, Jerusalem's Roman Streets, Western Wall tunnels, Kh. Tililiya, Nebi Samuel, Gihon, City of David, Shiloah Pool, Drainage canal, Givati Car Park, Tancred fortress, Light show 2010, Light show 2014. The following photo covers the entire area of the old city. The temple mount is seen on the lower-right side. This photo is part of a collection of aerial images of BibleWalks's partner. Jerusalem is about 1 hour drive east of Tel-Aviv along highway #1, and the walled old city is in the eastern side of the Modern City. You can drive to the municipal parking lot just outside the walls and near the Tower of David, the medieval fortress on the west side of the old city. There you can enter the walled city through the Jaffa Gate. You can first visit the museum in the tower, where a permanent exhibition of the history of the city is displayed. Walking through Jaffa Gate, into the old city and along David street. Follow the signs to the Christian Quarter to the Church of the Holy Sepulcher. After a visit in the church, walk along Via Dolorosa towards the Temple Mount. From Via Dolorosa you can turn towards the Western side of the temple mount, to the renewed Jewish Quarter. Alternatively, you can walk from Jaffa Gate around the walls, towards Zion Gate, the Jewish Quarter, or the Wailing Wall. Another option is to take a walk on top of the walls, entering from the outer side of the Tower. The Western Wall tunnels are also a must to see, but need to be booked in advance. The exciting new sites in town, located on the southeast side of the old city. Check the overview page and start your travel back in time to the first and second temple periods. There are many sites in the Mount of Olives area. You can get there from Mount Scopus. Check our overview of sites on the south west side of the old city. Park near the Zion Gate, then visit the sites of Mount Zion. Explore the Temple mount, where everything about Jerusalem started. Access is near the Southern Wall archaeological park, another site to visit. The best view of the city (from a distance) can be seen from the south side, along the Armon Hanaziv Promenade. The recommended time to visit this beautiful terrace overlooking the city is the afternoons. "But Melchisedech, the king of Salem, bringing forth bread and wine, for he was the priest of the most high God, Blessed him, and said: Blessed be Abram by the most high God, who created heaven and earth." "In Hebron he reigned over Judah seven years and six months; and in Jerusalem he reigned thirty and three years over all Israel and Judah. And the king and his men went to Jerusalem against the Jebusites, the inhabitants of the land, who spoke unto David, saying: 'Except thou take away the blind and the lame, thou shalt not come in hither'; thinking: 'David cannot come in hither.' 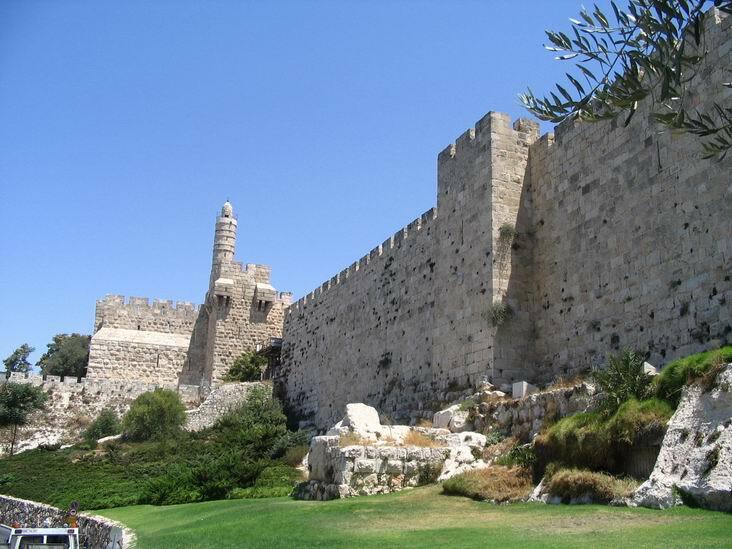 Nevertheless David took the stronghold of Zion; the same is the city of David. And David said on that day: 'Whosoever smiteth the Jebusites, and getteth up to the gutter, and taketh away the lame and the blind, that are hated of David's soul--.' Wherefore they say: 'There are the blind and the lame; he cannot come into the house.' And David dwelt in the stronghold, and called it the city of David. And David built round about from Millo and inward. And David waxed greater and greater; for HaShem, the G-d of hosts, was with him. And Hiram king of Tyre sent messengers to David, and cedar-trees, and carpenters, and masons; and they built David a house." Shalem - Canaanite city; referred in the Bible; name of a local god, Shalem. Yerushalem - Hebrew name; referred in the bible 653 times (4 times as Yerushalaim). There are several explanations for this word, one of them explaining that the name came from appending the root name "founded" and the city's name " Shalem", which means founded-by-Shalem. Jerusalem - English, German and French name. Note that "Je" replaces "Ye" in most of the biblical names. Yerushalaim - In Hebrew, the name of the modern city. Note that the city has over 70 additional names, such as "David's city", "Zion", "God's City". Sites Navigation: On all featured sites, you can use the navigation aid at the end of the page for proceeding to the next site. The navigation bar takes you through a virtual tour of the sites. At the bottom of each site you can navigate forward or backward, or return back to a full list of all sites in all regions of Israel.